In Canon's FD line of cameras, this was the version for the advanced amateur. The camera was introduced at about the same time as the original F-1, which it greatly resembled both in looks, features, and handling qualities. These were all metal, mechanical cameras, with match needle, manual exposure systems. One of the big features of the FD series of lenses and cameras, was the option of full aperture metering. 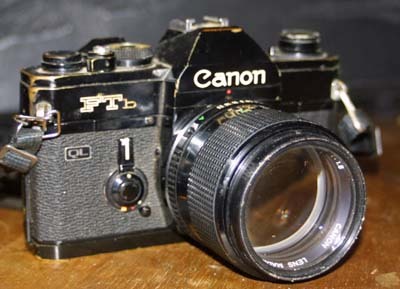 The basic FTb was the equal of the basic F-1 in every way, except for being limited to a top shutter speed of 1/1000, as opposed to the 1/2000 of the F-1. Where the F-1 began to show it's superiority, was with it's system of finders, backs, drives, prisms, and focusing screens. The original FTb was introduced in 1971. In July of 1973, the model was improved by adding a viewfinder display of the shutter speed, changing the configuration of the stop down lever, and increasing the size of the shutter release; this is the model I own. The shutter of the FTb is of rubberized cloth, and is mechanically controlled through a range of speeds from 1/1000 to 1 second, plus bulb. It has a horizontal traverse curtain and a synch speed of 1/60 of a second. The shutter may be cocked, and the film advanced, by either a single long stroke, or multiple short strokes of the ratcheted winding lever. Unlike today's electronically timed shutters, the FTb shutter can be used, and will cover it's full range of speeds with the batteries dead, or removed from the camera. The batteries are used only for the meter. The camera uses the common match needle type of manual exposure system. In this series of cameras, a look through the viewfinder shows a pair of needles on the right hand side. A plain, straight needle represents light value, and can be changed by changing the shutter speed, or the amount of illumination. A second needle has a small ring on it's end. This represents the aperture, and can be moved up and down by adjusting the size of the lens opening. The ring on the end of the aperture needle is approximately one F-stop in diameter. Getting the straight needle anywhere in the ring will give an exposure within half a stop of being right on. Towards the bottom of the right hand side, is a small rectangular reference mark. This is used for stop down metering with FD or the older FL series of lenses. 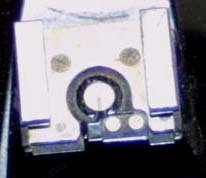 The straight needle is lined up with this mark, when the lens is stopped down, to set the exposure. In addition to exposure information, the viewfinder displays the shutter speed, and shows a small rectangle with rounded off corners. The rectangle shows the metered area of the prism. Canon called this semi spot metering, and it covers, perhaps, twelve percent (a true spot meter covers three percent or less) of the scene being photographed. This is very good for certain types of high contrast, or oddly lit scenes. The meter has a range, at ASA 100, of EV 2.5 to EV 18. Also in the center of the viewfinder is the focusing aid, which consists of a microprism collar surrounding a central split image rangefinder. The shutter speed dial sits on top of the camera, to the right of the pentaprism. This dial doubles as the film speed dial, through the use of a lifting collar, with a small window to display the film speed selected. The range of film speeds is pretty poor, by today's standards, going from ASA 25 to ASA2000. Next to the shutter speed dial, is the shutter release, with a locking collar. On the other side of the shutter release is the winding lever. The meter switch, as well as the rewind lever, are on the left hand side of the pentaprism. The aperture ring is on the lens itself, near the mount. On the front of the camera, to the right of the lens, is a lever which, when pushed inwards, manually stops down the lens to preview depth of field, and can lock up the mirror when pushed in all the way. This same lever, when pushed outwards, acts to set the camera's mechanical self timer. These are pretty much standard controls, all in the standard places. 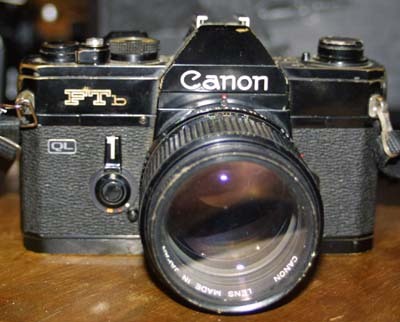 The FTb, along with a few other selected models, had the Canon QL (quick load) system. 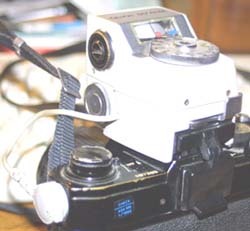 The quick load system allowed users to rapidly load film, without the need to thread it on to the ratcheted spool used to pull the film through the camera. This was accomplished through the use of a pair of cogs, and a special slotted shield. the film was simply pulled across the cogs, and had the shield pulled down over it. It was then threaded onto the take up reel as it was advanced. The auto aperture FD lenses were basically the old FL series of lenses with some mechanical improvements. The FL lenses would fit on the new FD cameras, but could only be used for stop down metering. Along with full aperture metering, the FD lenses were capable of being linked to an auto exposure system, though this feature was not supported in a camera, until the introduction of the EF. The older versions of the FD lenses had a self tightening bayonet lock. In newer versions this was modified into a quarter turn unit, with a release button. The newer version were quicker, but many photographers prefer the old style, since it can be turned to tighten if the mount loosens or wears. Both styles will attach to any FD mount camera. The FTb was one of the few cameras in the whole F line to have a hot shoe. The F-1 had none, neither did the TLb. Eventually the EF would be made with one, and it was included on all A series cameras. One interesting feature of some of the FD series cameras and lenses, was the inclusion of the CAT (Canon auto tuning) flash system. This worked via a ring attached to the barrel of the lens, and indexed to a nub on the focus ring. Using a CAT flash unit, the metering system would become part of the flash system. Focus information would be sent to the camera's meter, and would control the movement of the shutter/meter needle. The user need only match it to the aperture needle. This would offer, in theory, a perfect flash exposure, with no need for fiddling with distance calculations, or power levels. As far as I know, only the F-1, and FTb used this system. CAT capable cameras could be recognized by a pair of extra offset, contacts on the hot shoe. By the time the A series was released, the CAT system had become obsolete. The newer systems used microprocessors, and sensors which read exposure directly off of the film. There was no longer a need for an electromechanical system. A booster was available for the FTb, to extend the range of it's meter. This was a rather cumbersome device, but allowed properly exposed photographs to be taken in extremely low light. The unit fits into the hot shoe, and a shield flips down to cover the viewfinder. It uses the camera's own built in meter, but increases the sensitivity considerably. The battery needs to be removed from the camera, and placed in the booster finder, in addition to the pair already carried. A two pronged cord goes from the booster unit, and plugs into the camera's battery compartment. Exposure information is read from a window on the booster unit. It is capable of metering exposures of up to 30 seconds. The EV sensitivity of a booster equipped FTb is EV -3.5 at ASA 100. This equates to 15 seconds at f 1.2. As can be seen from the photograph, this camera is a bit the worse for wear. I bought it new, in 1974, and it has served me well. The old FTb has been bumped, dropped, bashed, and generally banged around, and has never failed me. This was also the camera on which I first began to learn photography. I am thankful that there were no auto exposure, or auto focus cameras available back then, for I would certainly have learned little or nothing from their use. The camera is so simple to use, that I often wonder why autoexposure/auto focus cameras were ever designed. The left hand cradles the camera, sets the aperture, and focus, while the right hand grasps the side, sets the shutter speed, and advances the film. After a few hours use, the camera becomes like an extension of the body. Focussing and setting exposure can be accomplished in a fraction of a second, and then the image is recorded.